Museums VictoriaFossilized teeth of the great jagged narrow-toothed shark. But the megalodon wasn’t the only giant shark in the prehistoric ocean. 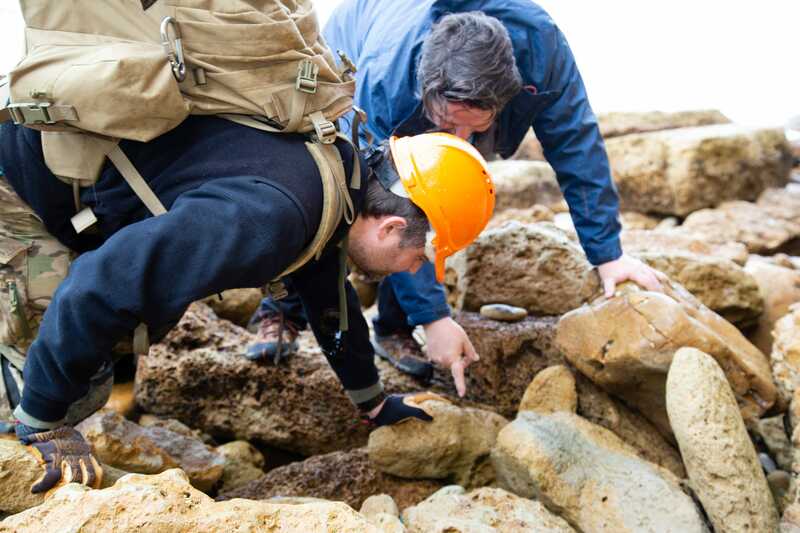 In 2015, an amateur fossil hunter discovered 45 shark teeth in Australia. Most of them come from another prehistoric shark, the great jagged narrow-toothed shark. The teeth are now on display at Museums Victoria in Melbourne, Australia. “The Meg” had one of the biggest opening weekends at the box office this year, taking in more than $US45 million. At the center of the movie is the megalodon, a giant prehistoric shark that ate whales and was 10 times bigger than a Tyrannosaurus rex. Scientists believe the megashark went extinct at least 2 million years ago. Shark skeletons are mostly made of cartilage, which does not fossilize well, so scientists have relied on the shark’s 7-inch-long teeth and plate-sized spinal bones to learn more about the animal. But stunningly large teeth – one of the megalodon’s defining features – are not unique to this prehistoric animal. In 2015, amateur fossil hunter Philip Mullaly found 45 shark teeth on a visit to his local beach in Australia. 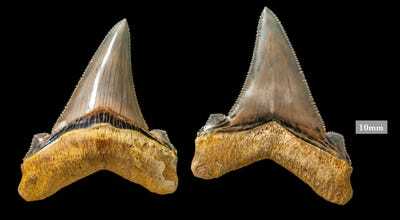 The teeth, most of which belong to a megashark that preyed on small whales about 25 million years ago, are part of a new exhibit that opened August 9th at Museums Victoria in Melbourne, Australia. Museums VictoriaMuseums Victoria curator Erich Fitzgerald and Philip Mullaly visit the site where Mullaly discovered prehistoric shark teeth in Australia. Mullaly donated the teeth to Museums Victoria, adding a rare display to the organisation. Collections of this kind tend to include just single teeth. The teeth suggest Australia’s oceans used to be home to a shark almost twice as big as a great white. 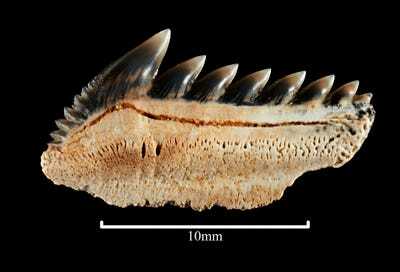 Some of them are roughly 3 inches long, and scientists have determined they belong to an extinct species called the great jagged narrow-toothed shark, which grew to a length of about 30 feet. People have previously discovered single teeth belonging to this shark, but Mullaly was the first to find a whole set in Australia. According to The New York Times, scientists excavated the teeth in late 2017 and early 2018. They discovered several more teeth on their trips; these belonged to the sixgill shark, which is smaller than the great jagged narrow-toothed shark. Museums VictoriaFossilized teeth of the sixgill shark. Tim Ziegler, a paleontologist at Museums Victoria, said in a statement that the smaller teeth came from multiple sharks and would have come loose while the sixgills were eating the carcass of a dead great jagged narrow-toothed shark. Sixgill sharks are still alive in Australia today, feeding on the remains of whales and other animals. The 45 shark teeth will be on display at Museums Victoria through October 7.